The Missouri Department of Transportation (MoDOT) says the minimum cost to reconstruct and expand I-70 in Missouri is $2 billion. To put that cost in perspective, Governor Eric Greitens’ proposed overall budget for MoDOT is $2.3 billion. 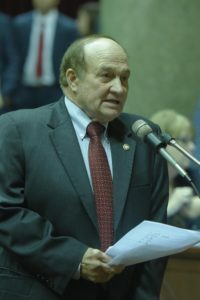 No bills have been filed in the Legislature this year regarding I-70, and Missouri House Transportation Committee Chairman Bill Reiboldt (R-Neosho) says nothing may happen this year. I-70 in Missouri was designed and built between 1956 and 1965. MoDOT says its oldest sections are 60 years old and its youngest sections are 51 years old. Reiboldt says lawmakers are currently studying all possibilities to replace crumbling I-70 and transportation in general. Reiboldt tells Missourinet a public-private partnership is also a possibility for I-70. He also says he met recently with Holcim executives, and that they told him transportation is their number one issue. Holcim’s website says its Ste. Genevieve plant is one of the world’s largest cement-producing facilities. I-70 in Missouri was intended to carry 12,000 to 18,000 vehicles per day. MoDOT says that it now carries 28,000 vehicles daily in rural areas, with about 10,000 trucks. MoDOT says I-70 at Independence currently carries about 98,000 vehicles daily, while I-70 at Wentzville carries about 75,000 vehicles per day, with 15,000 trucks. MoDOT says the cost to operate and maintain I-70 in its current condition is about $50 million annually. That includes resurfacing, bridge repairs, pothole patching, snow removal and mowing. The agency tells Missourinet they still have “conditional provisional” approval from the Federal Highway Administration to rebuild I-70 as a toll road. Voters would likely have to approve that, depending on how any enabling legislation is written. In 2014, then-Governor Jay Nixon (D) directed the Missouri Highways and Transportation Commission to provide him with a report on options for tolling I-70. MoDOT completed that report in December 2014, and it’s posted on the agency website.